An updated version of the life history of the Peacock Royal can be found by clicking this link. 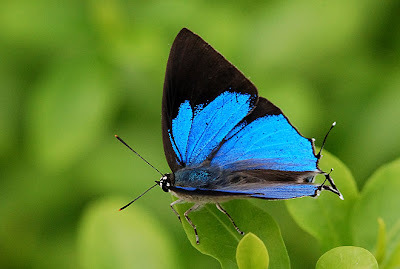 The upper side of the male is a beautiful royal blue with a broad black apical border on the forewing. 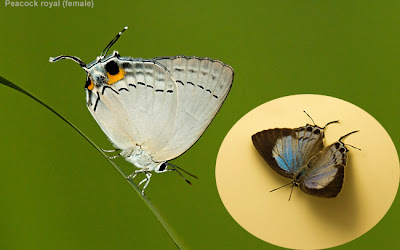 The female is a light pale blue with a series of black post-discal striae. The underside is a silvery grey with post discal series of dark striae on both wings. The tornal spots are orange-crowned and both sexes possess two pairs of tails. 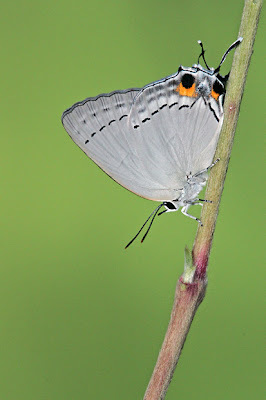 The butterfly is a fast-flyer in the field, often found feeding at flowering bushes and trees. When disturbed it flies rapidly high up to nearby shrubs but often returns later to the bushes to continue feeding. 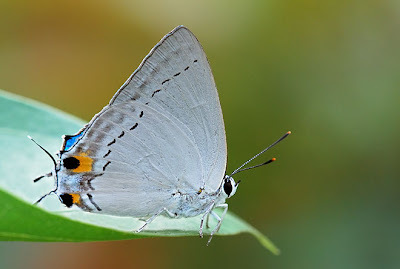 Males are often observed sun bathing showing off their beautiful blue uppersides under the sun. 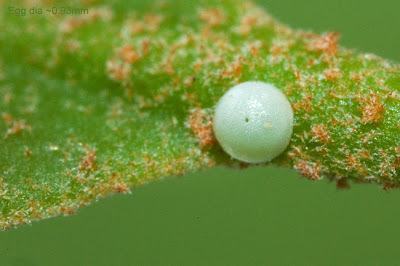 Eggs are laid singly on the young leaf surfaces or stems of the host plant. The colour of the newly laid egg is white to slightly greenish and mature eggs turn white before hatching. The egg is typically dome shape and measures ~0.93mm diameter. It has a depressed micropylar on top and the surface is slightly sculptured otherwise smooth. It takes 4 days for eggs to hatch. 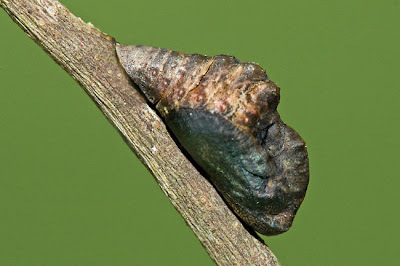 The young caterpillar does not consume the eggshell after hatching, leaving an empty eggshell with a small round opening atop the micropylar area. The caterpillar's body looks a bit shiny and light tan in colour with three darker tan wavy markings horizontally across the dorsal. 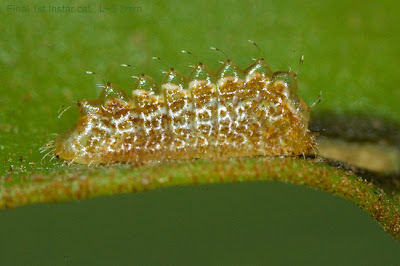 The 1st instar caterpillar is hairy with fine and short setae below and around the body and longer setae on top of the segments. 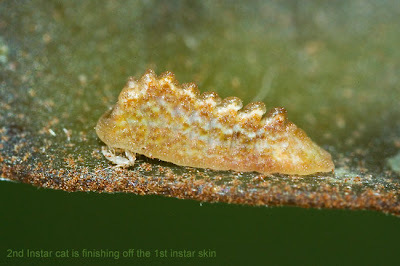 The 1st instar caterpillar has 10 body segments and the spiracles are located closer to the top side of the segments. At the top of each of the body segments are the saw-tooth liked tubercles with setae which has white colour tip. 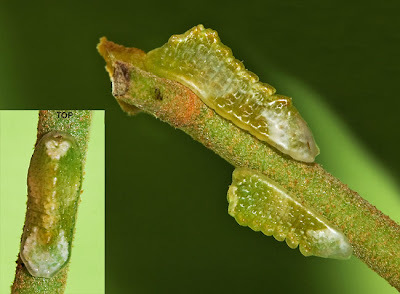 The 1st instar caterpillar feeds mainly on the under surface of the leave tissue and leaving many “windows” on the leaf. 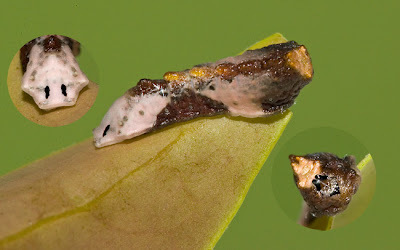 A newly hatched 1st instar caterpillar measures around1.2~1.5mm and about 2mm after half a day. 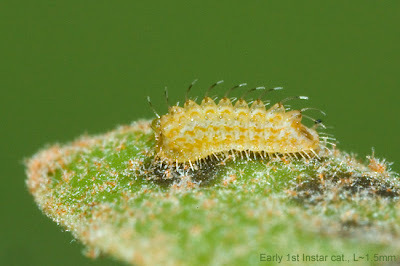 The 1st instar caterpillar feeds on the under surface of young leaf tissue. It takes 3 days for the 1st instar caterpillar to molt. 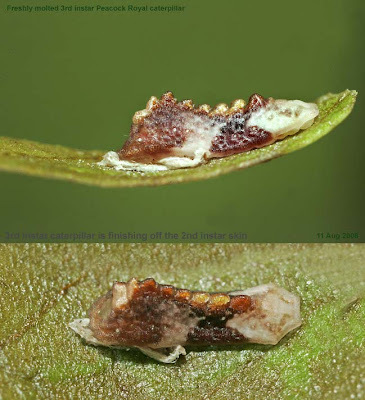 The freshly molted 2nd instar caterpillar immediately feeds on its 1st instar skin. 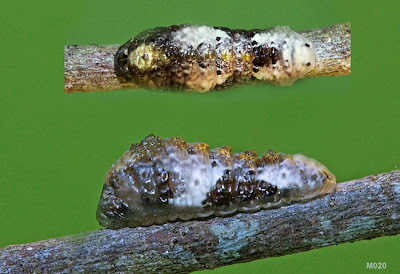 At this stage all the setae are dropped with body color and markings remain the same as the final 1st Instar caterpillar. Four days after, the caterpillar advances to its 3rd instar. Colour and markings remain the same (but I also notice some earlier breeds actual were green in colour) and it changes its feeding habit to eat on the edge of the leave. Green coloured 3rd instar caterpillars. The colour of the caterpillars blends in well with the environment e.g. the green twig. 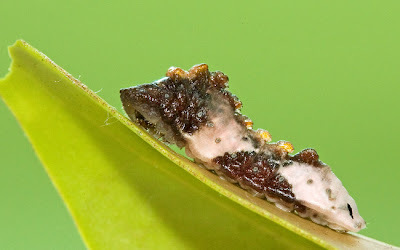 The freshly molted 4th instar caterpillar changes its body colour to maroon brown with three light pinkish cloudy patches located between the last segment leg and beginning of the end of the body after segment 7. On top of segments 2 and 3 is now dark in orange, this includes the tubercles at segments 5 ~7 as well. The tubercles on segments 1 and 2 are not so prominent on this 4th instar caterpillar. 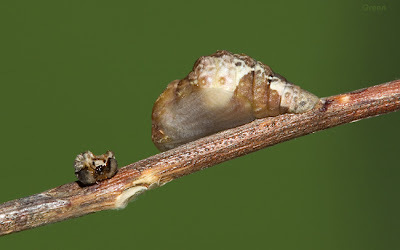 The transparent ‘air pockets’ on top of the tubercles of the 3rd instar caterpillar have now disappeared. A few hours after molting the appearance of this 4th instar changes. The light pinkish cloudy patches turn dusted pinky patches. The light pinkish cloudy patch at the front of head is now disappeared and replaced by three black marks and they look like two eyes and a mount. There are now two ‘black eyes’ appearing at the end of the abdomen as well. 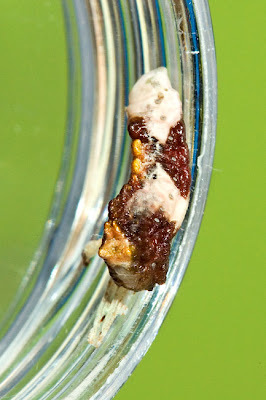 After 7 days the 4th instar caterpillar stops feeding and wanders around the container searching for a place to undergo its final molt into a pupa until it settles down on a twig in head down position. The pinkish cloudy patches slowly changed to white and the orange patches are getting lighter and less intense in orange. 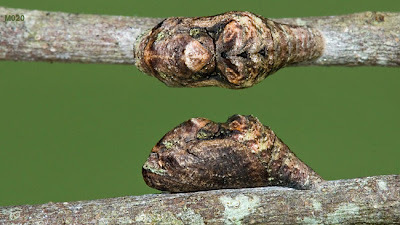 Two days later the caterpillar shreds its skin and prepares for pupation by attaching itself with the cremaster on the twig without silkpad, but unlike many other species, it has no girdle to support the pupa. Wow - you guys are great photogs - we in Africa can learn a lot from you! This looks really like one of our Iolaus species we get in Africa - I see it is the same tribe, Iolaini. Thanks, Steve. For visiting and your kind comments. Your website is awesome, and the butterflies in your part of the world are awesome! I've taken the liberty of linking your website in my links page. Cheers!